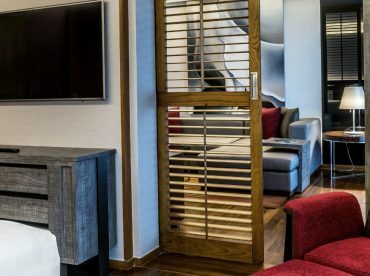 Our 32 sqm Executive Rooms offer sweeping views of the city, a Nespresso coffee machine, complimentary high speed Wi-FI, USB charging points, Wi-Fi music connectivity, a bathroom with separated bathtub and rain shower and full Executive privileges with a host of extras. Truly defining an urban escape with our Executive Rooms at this Bangkok city hotel you’ll enjoy full access to the newly designed Executive Club Floor Lounge, personalised check-in and late check-out, complimentary breakfast and evening cocktails in the lounge, 2 free mini bar soft drinks per day, free local calls and premium bathroom amenities from New York’s C.O. Bigelow plus exclusive Pullman Bangkok King Power accoutrements such as an access to the King Power Executive Lounge at Suvarnabhumi Airport upon departure and 15% and 20% King Power Duty Free discount vouchers. • Daily breakfast from 6.00 am. – 10.30 am. • Evening Cocktail and hors d’oeuvres from 5.00 pm. – 7.00 pm. • Complimentary coffee, tea, juices, soft drinks, fresh fruit and cookies all day. • Room service: From full meals to light refreshments, from local delicacies to international classics, our room service menu can suit any schedule or mood.